Solo-6 Custom, LP-Shaped Guitar from Schecter in the Solo series. tjon901's review"Classy singlecut from Schecter"
Schecters line of guitars is more metal based. They are trying to take on the ESP and Ibanez line ups with their guitars that are more metal oriented. 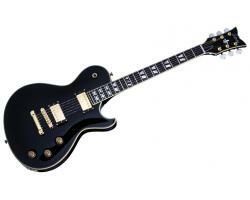 They also have more versatile models in their line that are based on the same models as their metal guitars. This is one of their more traditional designs based on the Solo shape. It is a single cut design with a mahogany body. The body has a flamed maple top. THe neck is mahogany as well with an ebony fretboard. The fretboard has 22 medium jumbo frets with split crown inlays. Some older models had 24 frets and a 25.5 inch scale. Up top on the 3x3 headstock you get schecter locking tuners with pearl buttons. The bridge is a locking Tonepros unit. The electronics are seymour duncan all around. The bridge pickup is a Seymour Duncan Custom Custom while the neck pickup is the classic Seymour Duncan 59. The controls are simple with two volumes and a master tone with coil tapping. Schecter guitars are a more traditional feel than your ESP guitars and Ibanez guitars. The neck on this guitar is a 3 piece mahogany neck. With 3 pieces it means its more stable and less likely to warp. The neck is a bit thicker than you find on most modern guitars. The neck join heel is nicely contoured so you get really good access to the upper frets. The ebony fretboard gives you a nice smooth feel while the medium frets are good for people who like a more traditional feel compared to modenr guitars. The Tonepros locking bridge is great. It means the bridge is locked down and not held in by string tension. This gives you more sustain and when you are changing strings the bridge doesnt fall off. The pickups in this guitar are great and they can do just about every type of music. The Seymour Duncan Custom Custom in the bridge is like a Custom but with a bit more weight and smoothness to it. The normal Custom has a ceramic magnet in it but this pickup has a more traditional Alnico magnet. This gives the pickup smoother high end and a more spongy traditional sounding low end. The 59 in the neck is a classic neck pickup. It has a great PAF style tone to it. It is super smooth in the neck and is great for lead tones. It is a good compliment to the Custom Custom in the bridge. The blues tones just pour out on the neck position. This guitar is a great alternative to your ESP and Ibanez guitars and because of its design it is also a good alternative to an Epiphone or even Gibson. It mixes the playability that you would get with an ESP or Ibanez with the classic design, feel and look of a Gibson. These guitars only cost about 600 USD so it is right in there with the ESP LTD line and most Ibanez guitars. If you are looking for a good single cut on a budget this is a good option. It has lots of pro features like locking tuners and locking bridges with Seymour Duncan pickups, a combination that is hard to find for less than a grand.